1. Only 20% of sunlight reaches 10m in clear water. 2. Enough penetration to sustain photosynthesis to approximately 100m in the sea. 3. High concentration of suspended particles can stop light reaching 3m. 4. TURBIDITY is the relative concentration of suspended particles. 5. Diffusion (light scatter) reduces light reaching certain depths, it also reduces shadows underwater. 6. The eye can see frequencies of visible light between 400nm and 760nm. 7. Colour is based on reflected light. When all colours are reflected you get white. When no colours are reflected, you get black. 8. Turbidity, depth, salinity, particle size, pollution all affect light absorption. 9. Fluorescents retain colour underwater because their wavelengths are not common and they emit colour when stimulated by light of any shorter wavelength. 10. In low levels of light, the pupil of the eye opens to admit more light. When fully open it switches from day-vision to night-vision (using cells in the eye called cones and rods, due to there shape). This increases sensitivity to light, but decreases the ability to distinguish fine detail and colour. This will occur in about 10 minutes, but can take 30 minutes from extremes. To help, wear red goggles 10 to 20 minutes before entering the water. 11. The speed of light depends on the density of the medium it’s traveling through. The denser the medium, the slower the speed. 12. Refraction – The tendency of light to bend as it passes from one medium to another. – Different speeds of light through different mediums due to different densities. Light coming to a divers eye underwater moves through 3 different media – water, glass, air – refracting each time. 13. Underwater objects appear closer by a ratio of 4:3 or if 4 feet away, it will appear 3 feet away. 14. Visual reversal in highly turbid water an object can appear hazy, which in air the eye associates with distance, so the object looks farther away. 15. Magnification factor makes things look 25% larger. Water conducts heat better than air because it is more dense than air. Water absorbs large amounts of heat (High Heat Capacity). 1. Sound travels best in a dense media, because it travels in pressure waves. The more tightly packed the molecules the easier it is to transmit wave motion from one molecule to another. (The more elasticity the better). 2. Fresh water at 15 deg C transmits sound at 1410 m (4625 ft) per second. Seawater at 15 deg C transmits sound at 1550 m (5084 ft) per second. 3. This is slightly more than 4 times the speed of sound in air. 4. Sound does not travel well across themoclines. 5. The brain determines the direction of sound by the slight delay between when a sound reaches one ear and then the other. In water, the faster speed of sound reduces the delay so much that the brain interprets the sound as reaching both ears at the same time. This makes the sound seem as if it were coming from overhead. Buoyancy = (Archimedes) Any object wholly or partly immersed in a fluid is buoyed up by a force equal to the weight of the fluid displaced by the object. 25.75m in fresh water = 25m in salt water. Factor of 1.03. Pressure increases by 1 ATM every 10 m of salt water. Pressure increases by 1 ATM every 10.3 m of fresh water. The tendency of a body to sink or float in water is measured as Specific Gravity. To determine buoyancy subtract the objects weight, from the weight of the water it displaces. Say an object weighs 100kg out of water. How much additional buoyancy would be required to lift the object from the bottom of the sea? Object weighs 100kg in air. Seawater weighs 1.03kg per Lt.
We have 100kg of downward force (gravity) and 20.6kg of upward force (buoyancy). 100kg – 20.6kg = 79.4kg of additional buoyancy. Disregarding the weight of the lifting device, calculate how much water needs to be displaced to make the object neutrally buoyant? 79.4kg / 1.03 = 77.1 Lts of water needs to be displaced. How much air is required for neutrally buoyancy? 2.Therefore 150 kg of downward force and 61.6 kg of upward force. 150 kg – 61.8 kg = 88.2 kg of sea water. Sink into fresh water an object that weighs 50 kg and displaces 300 Lt.
How much lead weight is required to make it 10 kg negatively buoyant on the bottom? Water displacement = 300 kg (no correction needed as it is in fresh water). For neutral add 250 kg + 10 kg to make it negative = 260 kg. You take a gas volume of 27 Lt from 32 m to 17 m in fresh water. What will the new volume be? Correct for pressure change in fresh water. So 27 Lt x 4.10 = 110.7 at surface. No pressure change requires because it is salt water. So 27 x 4.2 = 113.4 / 2.7 = 42.0 lts at 17 m.
Atmospheric Pressure:- The pressure exerted by the weight of the atmosphere at sea level. It is 14.7 psi or 1 atm or 1 Bar. Gauge Pressure:- Is the pressure designation that uses atmospheric pressure as its zero point. Expressed as ‘g’ i.e. psig. Absolute Pressure:- Is a pressure that uses a vacuum as its zero point, or its equal to Atmospheric Pressure + Gauge Pressure. Expressed as ‘a’ i.e. psia or ata. Ambient Pressure:- Same as Absolute Pressure. What is the ata at 18m? Body tissues are primarily water, pressure transfers through them directly and equally in all directions, with no direct effect. Pressure increases by 1 bar per 10.00 m in salt water. Pressure increases by 1 bar per 10.35 m in fresh water. (The gauge will under read in fresh water). If the temperature remains constant, the volume of a gas is inversely proportional to the absolute pressure. Therefore, if the pressure increases the volume must decrease. As absolute pressure increases on a gas, the volume of the gas will decrease proportionately. If a balloon is filled with air at the surface and taken to 20 m. What would the volume be? To lift an object requires 29 kg of buoyant force from 26 m. How much will the air required to lift the object expand when reaching the surface? While the pressure and volume of a gas are inversely proportional, the pressure and density of a gas are directly proportional. A diver’s air consumption rate is 2 bar / min at the surface. What will his air consumption be at 30m, and what will the density be? 3 atm + 1 atm = 4 atm (therefore 4 times as dense). 4 x 2 bar / min. = 8 bar / min at 30m. If a gas temperature rises and the volume stays constant, pressure increases. If temperature rises and the pressure stays constant, volume increases. A surface air supply has a 500 Lt per minute capacity. How much air is the compressor capable of per minute at that depth? The total pressure exerted by a mixture of gases is equal to the sum of the pressures of each of the different gases making up the mixture. – each gas acting as if it alone were present and occupied the total volume. The body responds to a gas you breathe based on its partial pressure – not on the percentage of the gas in the mix. Ptotal = ppA + ppB + ppC + ppD ………. An air mix of 1% CO2, 79% N2 and 20% O2 What’s the pp of N2 at 40 m? An increased pp of nitrogen causes nitrogen narcosis. Surface equivalency is the fraction of a gas you would have to breath at the surface to produce the same effect at a particular depth. Therefor is an air mix has 0.5% carbon monoxide. Breathing it at 40m would be the equivalent of breathing what percent at the surface? EAD = Equivalent Air Depth. Maximum oxygen pp = around 1.4ata. Maximum contingency pp = 1.6ata. To find the depth at which the nitrogen pp would be the same using air as with the ‘Nitrox’ blend in question. Therefore for 36% oxygen mix. Therefore, the bottom time for 30 m can be calculated as for 22.4 m (normal air) when using 36% oxygen mix. From the graph below find 22.4 on the X axis, move up to the red line (21%) them move to the right until intercepting the yellow line (36%) move down to read 30 m on the X axis. This shows why oxygen toxicity isn’t a problem when using air to a max. of 56 m.
Diving on Nitrox will not lessen the effect of narcosis. To find maximum contingency depth. 1. There are 2 types of oxygen toxicity, one involves symptoms in the respiratory system, and the other involves the nervous system. 2. Pulmonary oxygen toxicity (Lorrain Smith effect) results from a long exposure to oxygen at a pp of between 0.5 ata and 1.4 ata. Symptoms include:- Lung irritation, burning in the chest, and an irritated cough. Symptoms will resolve themselves in a few days with no after-effects. 3. Pulmonary oxygen toxicity would require more than 12 hours of breathing 100% oxygen at the surface. 4. Central nervous system (CNS) tends to be almost unpredictable other than it is a considerable risk at an oxygen pp of above 1.6 ata. 5. CNS oxygen toxicity involves the whole body and requires less time than pulmonary toxicity for symptoms to occur, but the oxygen pp must be higher. 6. Warning signs for CNS oxygen toxicity. T – Twitching in the face. 7. Using normal air, a diver is risking CNS above 1.6 ata at 66m. 8. On 100% oxygen a diver would reach a pp of 1.6 ata at 6 m.
9. CNS is considered life threatening in many diving situations because of sudden convulsions and unconsciousness. 10. Decongestants predispose you to CNS toxicity. Vitamin ‘E’, Valium and Magnesium reduces the likelihood of CNS toxicity. When diving, avoid CNS toxicity by staying within a maximum pp of about 1.4 ata. so 30% exposure = 210 / 100 x 30 = 63 minutes. 1. The quantity of gas dissolved in a liquid is proportional to the partial pressure of the gas. 2. The amount of gas that will dissolve into a liquid at a given temperature is directly proportional to the partial pressure of that gas. 3. Gas dissolves into a liquid until the gas balances with ambient pressure. This is called saturation. The gas entering the liquid is called gas tension. 4. If ambient pressure rises, more gas dissolves into the liquid until reaching saturation at the higher pressure. The difference between the partial pressure of gases in contact with a liquid and the gas tension within the liquid is referred to as the pressure gradient. 5. If pressure drops and gas tension becomes greater than ambient pressure, the liquid is said to be super saturated and gas will come out of solution until equilibrium is reached again. 6. The higher the temperature of a liquid the less gas can be held by that liquid. 7. Nitrogen absorption by the body is a direct consequence of Henry’s Law. Plasma:- Carries nutrients, chemicals, dissolved gases including some waste carbon dioxide and nitrogen. Plasma accounts for half the weight of blood. Carries most of the oxygen required via haemoglobin, a protein that bonds and unbonds with oxygen. Without haemoglobin, the blood would have to circulate the plasma 15 to 20 times faster to supply a resting body with sufficient oxygen. Red blood cells make up about 45% of the blood. Carries and releases oxygen efficiently because variations in oxygen partial pressure influences its capacity to remain bonded with oxygen. The heart, arteries, veins, and capillaries make up the cardiovascular structure. The heart moves blood through arteries, arteries branch into tiny capillaries, the capillaries lead to veins that return the blood to the respiratory system and heart to begin again. A 4 chamber pump. The upper chambers on each side are called the atria. The atrium receives blood and then pumps it into the ventricles below. The ventricles then pump blood away from the heart. Left side of the heart is larger than the right side. Left side supplies the whole body with blood. Oxygen poor blood returns to the right side of the heart. The carotid arteries branch off the aorta immediately and supply blood to the brain. Capillaries are microscopic vessels between arteries and veins; gas exchanges occurs in the capillaries. The pulse rate measures the frequency of the heart rate. An average adult at rest is 60 to 80 beats per minute. Blood flows into the arterial system in pressure surges that coincide with heart contractions. The systolic pressure is the surge, or high point as the heart contracts, and diastolic pressure is the lull after the surge, or low point when the heart relaxes. During stress or fright, the adrenal gland releases adrenaline into the circulatory system as part of the survival response of the body. Adrenaline stimulates the heart, constricts blood vessels, and increases the breathing rate to prepare the body to flee or fight a threat. 1. The respiratory system brings oxygen to the body and carries waste carbon dioxide out. 2. The process of using Oxygen is oxidative metabolism. 3. Breathing starts when the body detects a carbon dioxide increase and / or an oxygen decrease in the blood. 4. The reflex respiratory centres in the brain have primary command of breathing. 5. The peripheral chemoreceptors monitor oxygen levels and signal the respiratory centres when the partial pressure of oxygen declines below a specific level. 6. Carbon dioxide primarily controls breathing. 7. If the peripheral chemoreceptors detect low oxygen, but the reflex respiratory centre finds the carbon dioxide acceptable, the respiratory centre may not stimulate breathing. If the oxygen level is normal, but the carbon dioxide level is high, this will cause the respiratory centre to start breathing. 8. When a breath is required, the respiratory centre stimulates the diaphragm to flex downward causing a pressure decrease, causing in intake of breath. 9. The air passes the mouth, nose, and sinuses, which moisten and filter the air. 10. Air passes the epiglottis in the throat into the trachea (windpipe). The epiglottis acts as a valve between the trachea and oesophagus (which leads to the stomach). The trachea branches into the right and left bronchi, which lead to the lungs. Within the lungs the bronchi branch down to smaller passages, called bronchioles. The bronchioles terminate in the alveoli, which are sacs surrounded by pulmonary capillaries. This is where gas exchanges with the blood. 11. Blood at no point comes into contact with the air. 12. The respiratory system normally uses only 10% of the available oxygen in each breath. 13. Breathing rate is normally 10 to 20 times per minute. 14. The amount of air breathed in and out is called the tidal volume. 15. Vital capacity is the maximum volume that can be inhaled after total expiration. 16. Residual volume is the air left in the lungs after complete exhalation. 17. Dead air spaces are the portion of the diver’s tidal volume that plays no direct part in gas exchange. 18. Without equipment, dead air spaces consist of the sinuses, trachea, and bronchi. 19. There is a 15% to 20% reduction in tidal volume caused by water pressure compressing the thorax. 20. At depth, air becomes denser. Dense air is less smooth at a given speed. i.e. a poor lamina flow. The air becomes turbulent in the trachea and bronchi with air moving faster in the centre leading to swirls that rotate away from the direction of travel at the sides increasing resistance. 21. This resistance has a benefit in that it causes a slight pressure increase in the bronchioles and alveoli during exhalation. This increase helps keep the air passages from collapsing after exhalation. 22. Resistance causes more problems than benefits. The faster the air moves, the denser the air, and the more irregular the air passage, the more energy must be consumed to overcome resistance due to turbulence. Therefore, conserve energy and breath slowly to minimise resistance caused by turbulence in the airways. 23. An involuntary response to breathing is called bradycardia, or slowing of the heart. Apneaic bradycardia is triggered when by cold moisture on the face, which slows the heart rate. 1. During breath hold diving the circulatory system uses oxygen stored in the lungs, muscles and blood to supply tissues. 2. Accumulating carbon dioxide creates urges to breathe and eventually it is too great to ignore, forcing the diver to surface and breathe. 3. Hyperventilating (3 to 4 times) can increase breath hold time. Doing so reduces circulatory carbon dioxide so it takes longer to accumulate enough to stimulate breathing. Excessive hyperventilation may lead to shallow water blackout. 1. Caused by excessive hyperventilation, depleting a divers carbon dioxide level. 2. At depth, a divers body consumes oxygen faster than carbon dioxide accumulates to stimulate breathing. 3. Depleted oxygen causes no problem at depth because high pp allows haemoglobin to bond with the remaining supply. 4. The diver ascends, the pp drops and haemoglobin can no longer bond with oxygen; the diver blacks out without warning due to hypoxia (insufficient oxygen). When the carotid-sinus receptors detect high blood pressure, it stimulates the cardioinhibitory centre, which slows the heart rate. When the carotid sinus receptors detect low blood pressure, it stops stimulating the cardioinhibitory centre, which in turn stops sending signals to the heart. The heart rate then increases. Wearing anything tight around the neck could constrict the carotid sinus. This could lead to unconsciousness preceded by light headiness and discomfort. 2. The most common is when a diver fails to breathe slowly and deeply enough. Resulting in headache, confusion and accelerated breathing. 3. Some forms of closed and semiclosed scuba (rebreathers) have been associated with hypercapnia. 4. Heavy work underwater can produce carbon dioxide faster than the respiratory system can eliminate it. 5. Skip-breathing. (Holding the breath while scuba diving in an attempt to extend the air supply). 6. High carbon dioxide levels due to contaminated air. 2. Excessive voluntary hyperventilation or unintentional hyperventilation due to stress or fright. 3. Symptoms are light-headiness which can be followed by fainting. 4. Hypocapnia during breath holding may lead directly to shallow-water blackout without warning. 5. Shallow-water blackout gets its name because it occurs on ascent near the surface following a breath holding dive. Due to a low carbon dioxide, level there is no stimulus to breathe. The diver stays underwater longer using more oxygen. The divers body depletes the oxygen supply, but increased partial pressure of oxygen at depth in the alveoli allows haemoglobin to continue using oxygen even after dropping below a level that would cause unconsciousness at the surface. When the diver ascends the oxygen partial pressure in the lungs falls rapidly, so the haemoglobin can no longer bond with oxygen and supply the body. Consequently, hypoxia results instantly, and the diver blacks out. 1. Generally, carbon monoxide poisoning occurs from contaminated air. It usually occurs with various oil-derived hydrocarbons that has a strong smell or taste. 2. Haemoglobin’s bond with carbon monoxide more than 200 times more readily than with oxygen, but will not unbond as easily. It can take up to 12 hours for the body to eliminate it. 3. Carbon monoxide bonds with enzymes in the blood. 4. When carbon monoxide poisoning symptoms occur – headache, confusion, and narrowed vision. 5. Breathing air contaminated by carbon monoxide at depth results in the haemoglobin carrying less and less oxygen as the carbon monoxide bonds with it. However, at depth blood still carries sufficient oxygen dissolved in plasma by high pp to meet tissue demands, when the diver surfaces, plasma no longer can carry enough dissolved oxygen and the diver blacks out from hypoxia. 6. Contaminated air may cause lips and nail beds to turn bright red, headaches, nausea, dizziness, and unconsciousness. 7. Smoking raises carbon monoxide levels in the blood 3 to 12 time’s normal which impairs oxygen transport and carbon dioxide elimination. 8. It takes 10 to 12 hours for gas exchange to return to normal after smoking. 9. Treatment:- Fresh air, oxygen if available. Medical attention is needed in all cases. Gases dissolve into liquids proportionately to the pressure. This is the basis for decompression. Oxygen is consumed metabolically, but nitrogen gas is physiologically inert and is therefore a concern. At the surface the body is saturated with nitrogen, as the diver descends the body isn’t saturated any more because more nitrogen from the breathing gas can go into solution in the tissues, and begins to do so according to Henry’s law. The pp in alveolar air increases. If the diver were to stay at depth long enough (12 or more hours) his body would reach saturation once again. Saturation occurs exponentially, it take less time to saturate to 50% than to go from 50% to 100%. To reach 50% is called the tissue half time. Different tissues have different half times. Blood absorbs rapidly and contains little nitrogen before it saturates. These are called fast tissues. Fat absorbs a lot of nitrogen and has a long half time, these are slow tissues. When a diver ascends the pressure decreases on the body. As the diver has been absorbing, nitrogen during the dive the tissue pressure exceeds the surrounding pressure. The tissues are then said to be supersaturated. That is they contain more nitrogen than they can hold at the ambient pressure. So nitrogen begins to dissolve out (exsolve) of the tissues and the body begins to eliminate it, which is where potential decompression sickness problems arise. The introduction of the Doppler ultrasound bubble detector in the 1970s discovered small bubbles in the bloodstream. These bubbles are called silent bubbles because they don’t produce DCS. Smaller bubbles are called microbubbles. Microbubbles tend to combine, forming larger bubbles, eventually reaching the size of harmless, but detectable silent bubbles. 1. Fat is a slow tissue. 2. Fatter people are more likely to get DCS. 1. The circulatory and respiratory systems work less efficiently in older people. This interferes with the gas exchange. 2. Remaining fit and eating less fat can help. 1. Dehydration reduces the amount of blood available for gas exchange, slowing nitrogen removal from the body. 2. Consumption of diuretics, (like caffeine) profuse perspiration and dry scuba air all tend to dehydrate. 3. During metabolism of alcohol, a divers body uses a great deal of water, thus a diver with a hangover is likely to be partially dehydrated. 1. Any condition that affects normal circulation can potentially affect nitrogen elimination. 2. Healed injuries may produce local circulation difficulties and illness can produce a general reduction in circulatory efficiency. 1. Before a dive, even small quantities tend to accelerate circulation and can cause tissues to carry higher amounts of nitrogen. 2. Following a dive alcohol dilates capillaries, possibly increasing the rate of nitrogen release and contributing to bubble formation. 3. Alcohol is also a diuretic. 1. Elevated carbon dioxide from skip breathing or improper breathing may interfere with gas transport by the circulatory system by dilating capillaries and increasing nitrogen uptake under pressure. 1. Diving in cold water or with an inadequate exposure suit changes normal circulation as the body takes heat-conserving measures. 2. At the start of a dive, nitrogen goes to all parts of the body, but as heat conservation reduces circulation, there is less blood to carry away dissolved nitrogen during the ascent. 1. Exercise while diving accelerates circulation, Upon surfacing and resting there is no corresponding circulation to accelerate nitrogen elimination. 1. Reduced atmospheric pressure at altitude increases the pressure gradient between tissue and ambient pressure. 2. If DCS occurs due to altitude returning to sea level does not usually alleviate it. 1. Paralysis, shock, weakness, dizziness, numbness, tingling, difficulty breathing, joint, and limb pain. In most severe cases unconsciousness and death. First aid:- Treat for shock, oxygen, CPR. Re-pressurisation. 5. The wheel makes it possible to calculate multi-level dive times by giving credit for slower nitrogen uptake in shallow water. 6. The wheel allows the diver to more closely calculate time and depth profiles. 1. DCS may take up to 36 hours after the dive to manifest. 2. About half of all cases, appear within 30 minutes. DCS gets worst with time unless treated. 3. The most common symptom is excessive fatigue. Type I – Skin and pain only symptoms. Type II – More significant symptoms. Both may be present together. Bubbles coming out of solution in skin capillaries, characterised by a red rash in patches, usually on the shoulders and upper chest. Not serious by itself. Joint or limb pain occurs in about 76% of DCS. Bi-symmetrical symptoms are unusual. Considered serious. Can affect movement, touch and life support functions. May become paralysed from the neck down. Considered most serious. Bubbles travelling to the brain can cause a stroke as they block blood flow. Symptoms similar to arterial gas embolism, including blurred vision, headache, confusion, unconsciousness and death. Considered most serious. DCS manifesting itself in lung capillaries signals the possible onset of life-threatening symptoms. It’s rare. Silent bubbles and microbubbles reaching the pulmonary capillaries normally diffuse into the alveoli or in rare cases may travel into the arterial system and cause neurological DCS. The heart rate will rise and blood pressure will drop. Without treatment, the circulatory system may fail completely. Pulmonary decompression sickness creates breathing pain, a short irritating cough. The victim feels air-starved, hence the nickname ‘the chokes’. Symptoms progress rapidly and may lead to shock. 1. When breathing air, nitrogen narcosis develops with an increase in nitrogen partial pressure, typically at about 30 m. The effect of a gas depends upon gas solubility in nerve cells. 2. Most gases can cause anaesthesia under high partial pressure. Helium is not narcotic even under very high pressure. (Helium used for tech diving). 3. Drugs used to counter such as:- travel sickness, hay fever and diarrhoea other medicine such as sleeping pills and barbiturates all have an anticholingeric effect, meaning they block transmissions of nerve signals and increase nitrogen narcosis. Narcoses can occur at depths of 18m. 4. Alcohol is the worst of all, any medicine that makes the mouth dry may increase narcosis at depth. 5. Some seasickness pills have caused extreme narcosis at 18 m.
6. Effects:- Impaired judgement and co-ordination, false sense of security, lack of concern for safety, may also feel anxious or uncomfortable. 2. If it deviates more than a few degrees it can be life threatening. i) Initially skin capillaries dilate, allowing heat from the blood to radiate. ii) Perspiration follows, cooling the skin. iii) The pulse accelerates to circulate blood more rapidly. i) Is the condition when the body works at maximum capacity to keep the core temperature cool. ii) Symptoms:- Weak and rapid breathing, weak pulse, cool and clammy skin, sweaty skin, dehydration, nausea and weakness. i) Symptoms:- Strong and rapid pulse, perspiration stops, the skin is flushed and hot. At this point, the core temperature rises because the body’s cooling mechanisms have failed. 6. Brain and systemic damage are likely, without medical attention, even death. 7. Heat stroke is considered a medical emergency. i) Temperature centres in the hands, feet and head trigger heat-conserving responses that start with a change in circulation. ii) Blood flow to the extremities slows through vasoconstriction (constriction of blood vessels) to reduce heat loss. iii) This results in numbness in the fingers and toes after a long exposure. iv) Then the body reacts by shivering, which generates heat through muscle activity and accelerated metabolism. v) The head loses considerable heat because the body can’t reduce blood supply to the brain. 9. Hypothermia, if the diver ignores shivering, the core temperature will drop, leading to hypothermia. 10. As the condition worsens shivering and vasoconstriction cease. The diver suddenly feels comfortable as warm blood rushes to the skin. This is dangerous because the body now loses heat at an uncontrolled rate, and the core temperature drops rapidly. The diver then becomes drowsy, uncoordinated, and forgetful. If unchecked, the diver loses consciousness, followed by coma and death. 11. Water conducts heat 20 times faster than air. 12. Water must be over about 27 C to enjoy a dive without insulation. 1. Any air space can suffer barotrauma (pressure injury) during ascent or decent. 2. Descending barotrauma are called squeezes and ascending barotraumas are called reverse squeezes or reverse blocks. 1. The outer ear traps sound waves and channels them down the auditory canal to the eardrum (tympanic membrane) of the middle ear. 2. Sound waves vibrate the eardrum that is attached to 3 bones that conduct and magnify vibrations, the ossicles. 3. Vibrations go from the ossicles into the cochlea, an inner ear organ filled with liquid called perilymph. 4. The ossicles attach to the oval window of the cochlea, which flexes in and out in response to ossicle vibration. 5. As the oval window flexes, it pushes against the perilymph, causing pressure waves to oscillate through the cochlea. 6. The pressure waves stimulate auditory nerve endings in the cochlea, turning the pressure waves into nerve impulses the brain understands. 7. The round window on the cochlea acts as a pressure compensator, flexing outward when the oval window flexes inward against the incompressible perilymph, and flexing inward when the oval window flexes outward. Without this action, hearing would not take place. 8. Also in the inner ear are the vestibular canals that control balance. Pressure on the ear can not only affect hearing, but balance too. The diver compensates for increase pressure as he descends by blowing additional air through the Eustachian tube in the middle ear, restoring equal pressure to both sides of the eardrum. 10. This equalisation is accomplished using the Valsalva or the Frenze manoeuvre. 11. The Valsalva manoeuvre uses the diaphragm and attempts to exhale against a pinched nose. This method is mainly used when starting diving. 12. With the Frenze, manoeuvre the diver users throat muscles to compress air against a pinched nose. This method minimises round-window rupture. 13. Eardrum rupture if a diver with un-equalised ears descends faster than hydrostatic pressure can force liquids from the tissues into the middle ear, the eardrum may burst inward. When this happens the diver, feel sharp pain, followed by immediate relief as the break admits water equalising the space. As the water is colder than the ear space this can cause vertigo, but this soon passes as the water warms. Infections are likely, but it will heal. 14. Middle ear squeeze if a diver fails to equalise the pressure forces the eardrum in toward the un-equalised spaces. Causing pain, the hydrostatic pressure forces fluids and blood from the tissues surrounding the middle ear into the air spaces of the ear. As this happens the pain diminishes and the ears feel full of liquid dampening vibration that passes through it, diminishing hearing. This usually heals with proper treatment, but if not treated can lead to permanent hearing impairment from infection. 15. Reverse squeeze Results when on ascent, the air in the middle ear fails to exit via the Eustachian tube. This can cause an outward rupture of the eardrum. Reverse equalisation can sometimes help. 16. Ear plugs: Earplugs create air spaces between the plug and the eardrum that cannot be equalised. If the diver tries to equalise this will make the problem worst because adding air to the middle ear increases the pressure difference. In addition, hydrostatic pressure may force the plug deeper into the ear. 17. Round-window rupture or Inner-ear barotraumas If a diver delays equalisation on the decent and then attempts a forceful or lengthy Valsalva manoeuvre this may rupture the round-window. If equalisation is delayed the round-widow in the ear bulges outwards in response to the pressure transmitted to the cochlea. If the diver at the same time equalises using a forceful or lengthy Valsalva, the perilymph pressure increases combines with the pressure transmitted from the eardrum and can rupture the round-window. This rupture causes the diver’s ears to feel blocked, and the diver may have a hearing reduction often with ringing sounds and vertigo. This is a serious injury, failure to have it treated can lead to permanent hearing reduction. 18. Otitus externa (swimmers ear) Not a barotrauma, but very common. This condition results from pH of the ear canal becoming alkaline instead of acid due to repeated exposure to water and humidity. Symptoms range from an itch, closure of the external ear canal, swelling, fever, and pain. Treat the ear before the symptoms appear with an over-the-counter alcohol mix by flushing the ear canal. Any wax should be removed periodically. 19. Exostoses Repeated exposure to cold water can cause bony bumps in the ear canal, which can trap debris. The ears should be cleaned at least twice a year. 20. Sinus squeeze A diver who descends with blocked sinuses may or may not feel pain as pressure pushes in on trapped air pockets. If the decent is rapid there may be pain between the eyes, over the teeth or in the cheekbones. The pain usually goes as hydrostatic pressure forces blood and fluid from surrounding tissues into the air pockets. On ascent the air re-expands, pushing the fluids and blood into the nasal cavity. The diver surfaces with blood in the mask, a sure sign of sinus squeeze. It will heal on its own and requires little or no medical attention unless accompanied by severe pain. If pressure compresses the lungs below residual volume, it can produce injury, but this requires a breath hold dive to extreme depths. 1. The lungs can overexpand when surfacing with full lungs and holding the breath in as little as one and a half metres. 2. Lung expansion injuries are at greater risk nearer the surface where the ratio of gas-volume increases per metre rises in accordance with Boyle’s law. 3. Rather than bursting like a balloon, the lung tears. The injury arises not from the tear, but from air escaping and entering the tissues and or bloodstream. 4. Any lung over-pressurisation causes pulmonary capillaries and alveoli to rupture, mixing blood and air in the lungs. Often, this causes the victim to cough up blood. 5. An embolism is any foreign body in the bloodstream that can block its flow. 1. The most serious injury from lung over pressurisation develops if air enters the bloodstream through ruptured alveoli into pulmonary capillaries, causing an air embolism or arterial gas embolism (AGE). 2. Air bubbles can lodge anywhere and stop blood flow to tissues. 3. If bubbles go into the carotids, which is likely, they will go to the brain and cause cerebral air embolism. 4. Compared to decompression sickness embolisms tend to be rapid and dramatic. Symptoms include:- dizziness, confusion, shock, personality changes, paralysis, unconsciousness, death, and heart attack. 5. Once in medical care re-compression is required to diminish bubbles. 1. If an over-pressurised lung tears at its surface, the expanding air leaks between the lung and the pleural lining (chest wall), collapsing the lung either partially or entirely. 2. A collapsed lung is called a pneumothorax. 3. A pneumothorax alone is generally not life-threatening because the victim still has another functioning lung. 4. The collapsed lung causes severe chest pain and may cause the victim to cough up frothy blood. 5. Spontaneous pneumothorax occurs without an expansion injury, through a weakness in the lung suddenly tearing and leading to lung collapse. If this happens underwater, it can be aggravated during ascent when air pressing against the collapsed lung expands increasing pressure on the injured lung. No further diving unless surgery can correct the problem. 6. Once in medical care, surgical removal of air from between the collapsed lung and the pleural lining, followed by lung re-inflation is required. 1. When air accumulating in the mediastinal (centre of the chest) presses on the heart and major blood vessels interfering with circulation. The victim may feel faint and short of breath. It is far less serious than either pneumothorax or air embolism. 2. Once in medical care oxygen may be administered. 1. 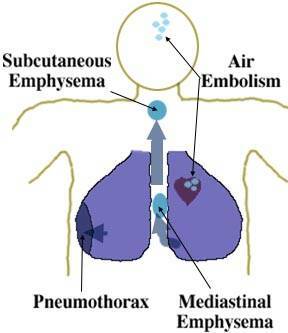 This occurs with mediastinal emphysema as air seeks its way from the mediastinum, following the part of least resistance into the soft tissues at the base of the neck. This causes the victim to feel a fullness in the neck and to experience a voice change. The skin may crackle if touched. 1. Treat any lung expansion injury as if it were an air embolism. First aid is the same as for DCS. – Treat for shock, oxygen, CPR. Re-pressurisation. 1. All tables and computers are based on Haldanean decompression model, which are mathematical extrapolations. 2. First tables produced in 1906. 3. Different parts of the body absorb and release dissolved nitrogen at different rates. 4. Haldane’s original model had 5 compartments, from 5 to 75 minutes, modern versions have 14 or more, ranging from 3 to more than 600 minutes. 5. Each compartment has a halftime for the rate at which it absorbs and releases nitrogen. 6. Halftime = the time in minutes, for a particular compartment to go halfway from its beginning tissue pressure to saturation at a new depth, in exponential progression. 7. After 6 halftimes the compartment is considered saturated (actually 98.6%). 8. The difference between the dissolved nitrogen pressure and the surrounding pressure (whether ascending or descending) is called the pressure gradient. 9. M-value = the maximum tissue pressure allowed in the compartment when surfacing to prevent exceeding acceptable gradients. (in our diving we only use the one that applies at the surface). 10. The M-value is calculated for surfacing at sea level, at an altitude higher than 300m the gradient may be too high unless you use altitude diving procedures. 11. The US Navy used Haldane’s tables and revised them periodically to meet changing needs. 12. The 1950 (current) US Navy tables had 2 important differences from the original Haldane model. a. 6 compartments were used with 120 minutes halftimes. b. Surface interval credit added all divers in the previous 24 hours and were treated as one dive. a. Many early sport divers were ex Military. b. The US table were available to the public. c. They could be relied on. d. Before computers it was hard to calculate a table. 14. The original US Navy tables designed its surface interval credit on the worst case 120 minutes halftime. This is why, worst case, it take 12 hours to be clean. 15. In the mid 1980’s Raymond Rogers a Divemaster recognised that the Navy tables might not be ideal for recreational diving. a. The 120 minute surface interval credit was excessive for no-decompression dives. b. The Navy tables were designed for males, fit and between 20 and 40 and not females etc. c. Doppler ultrasound flow meters had not come into being. a. The 60 minute surface interval credit concept. b. Extensive testing of multilevel diving. c. Included a broader demographic test subjects. d. The test were based on limiting Doppler detectable bubbles. e. Multi-day testing successfully tested the RDP making 4 dives daily for 6 days. 1. Halftime surface interval = 120 minute 60 minute. 1. Capillary waves – very small. 7. When a wave is as deep as its height, bottom friction slows the forward speed, it bunches up and becomes higher and steeper then breaks. 1. Coriolis effect – Northern Hemisphere – deflections to the right. 2. As a result water piles up in the middle of the pacific ocean. 3. Northern hemisphere trade winds blow from the NE to SW.
4. Currents negligible at depths of 190m. 5. Wind energy and the coriolis effect drives the ocean currents. 7. Southern hemisphere major ocean currents flow counter-clockwise. Introduction: Hello my name is ‘ ‘ I am your Instructor for Module ‘ ‘ today. Performance Objectives: By the end of this lesson you will be able to:- (from manual). Value: From O/W manual, or make up. HOW – EXPLANATION (steps) K.I.S.S. (Remember BRIEF). Where: In Shallow or Deep water. When: In a few moments, after my demonstration. Other Directions: My D.M. will look after you while I perform a demo of the skill. – Link arms. I will come to each of you one at a time to perform the skill. Signals: Up, Down, Stop, Do over, Breath in / out, Out of air. DEMONSTRATION (reminders) Check with D.M. before and after each Demo / Student. Actually Occurred: When OK shake hand, tap own head and remind student of any problems. Identify Problems: However, I did see a couple of problems . . . Suggestions: Next time try . . . Performance Objectives: You are now able to:- (from manual). Reinforce Value: Why are these skills important to us, because . . . (see VALUE at the top). 1 Significantly inaccurate information. or Read from script. d) Explained Signals and How and When Skill will be conducted. 3 Fulfilled 2 or more points. 4 Fulfilled 3 or more points in a timely manner. 5 All 4 points in a fluid, relaxed manner. 2 Significant difficulty or error. 3 Correct, but too quickly. 5 As 4 with exaggerated movement, easy. 2 Missed problem or responded inappropriately although no hazard. 3 Responded correctly – but too slow. or no problems occurred. 5 Responded correctly & quickly – used ‘remember’. 3 Organised, safe, used time effectively. 4 All of 3 and provided positive reinforcement (shake hand) or used Assistant effectively. 1 1 point for each of the following 5 areas covered. a) Positive reinforcement (good well done). c) Offered a solution / suggestions. 1. Contact Splash and shout “Diver you OK – Diver you OK”. 2. Approach Approach the head with them slightly on your left. 3. Roll Turn them face up, using tank valve. 4. Their Buoyancy Remove their weight belt. (in all cases). 5. Your Buoyancy Remove your weight belt. (in all cases). 6. Their Mask Remove their mask. 7. Your Mask Remove your mask. 8. Open Airway Finger on jaw. 9. Check breathing Look – listen and feel for breathing. Cover mouth with thumb – Don’t put fingers over throat. (Roll victims whole body towards you). 11. Shout for Help “Help ! – I have an unconscious non breathing diver”. Don’t put fingers over throat. 13. De-kit them Start to de-kit them – leave floating in BCD. 14. Arms Move their arms over their body. 15. De-kit yourself Remove your own scuba unit. 16. Before toe Slide them out of their BCD. 17. Rescue breaths Continue 1 breath every 5 seconds as before. We hope you have leaned and understood your PADI Dive Theory – with these revision questions and answers on Dive Physics.